This is what happens when you demonise people, when you tell people that someone’s very presence is a threat to you and to your children. For some people, “looking a bit trans” is sufficient grounds for action against a complete stranger who’s minding their own business. It’s not just people like me. It’s particularly horrific for refugees, especially since the whole Brexit mess began. The Overton Window, the range of political discourse that’s considered acceptable in society, has moved so far to the right that supposedly mainstream political parties are echoing the manifestos of the BNP and other far right groups from previous decades. What used to be unacceptable racism is now “asking difficult questions”. That demonisation has consequences big and small, and it always, always ends up with people getting attacked. For example, this week we saw horrific footage of a Syrian kid being “waterboarded” by bullies; it’s the latest in a campaign of abuse that’s seen him being doused with water, verbally abused and his hair set on fire, as well as physical violence. His sister has been bullied too. 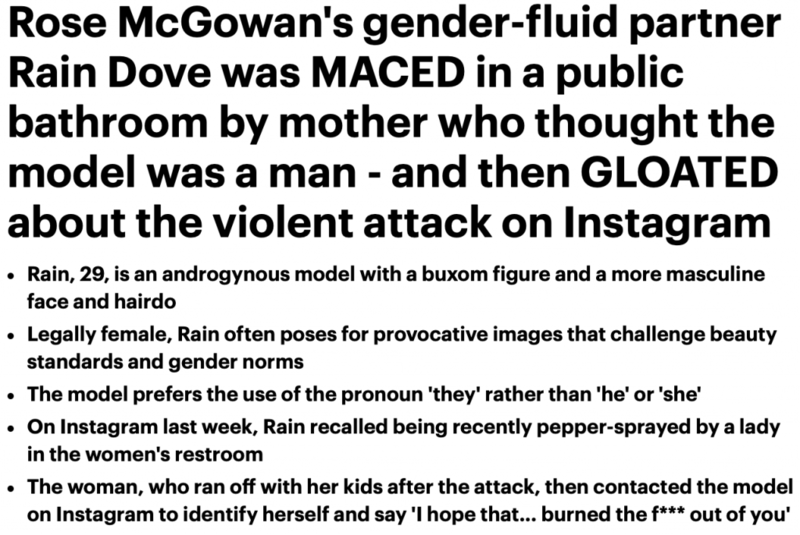 The same Daily Mail that’s so concerned about Rain Dove was also concerned about this kid: after years of demonising refugees, the Mail can’t imagine why anybody would pick on a child just because he’s Syrian. The Sun thinks it’s a shocking crime too. That’s the same Sun that paid Katie Hopkins to call immigrants “cockroaches”. You’ve got to admire the process here. First of all, newspapers help to create a climate of fear and hatred. Then, they get to run shocked stories when people act on that fear and hatred. These publications aren’t just reporting hate crime. They’re fostering it.